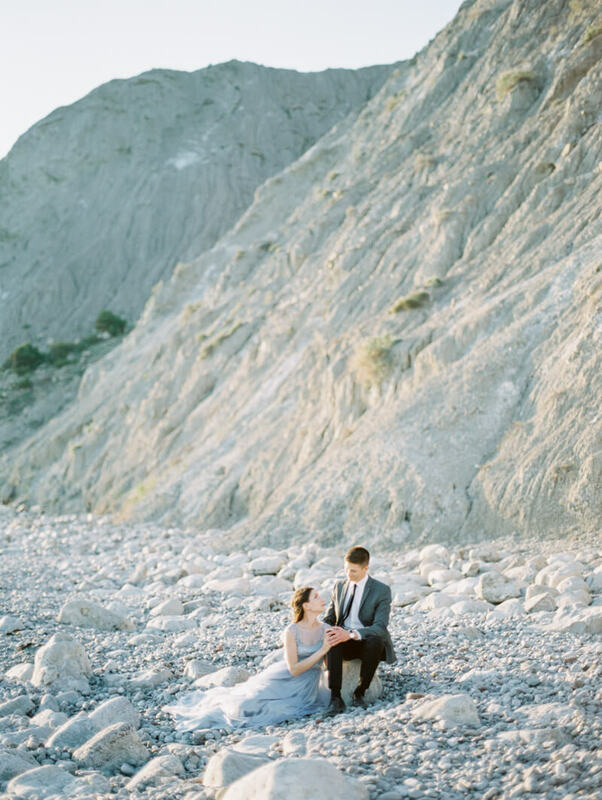 Zhenya and Taras dreamed of a wedding at the Cape of Crimea and the finished product was a thing of beauty. Set against the majestic mountains and juniper trees, this was not only a celebration of two people uniting in marriage, but also the incredible gift of witnessing color, sun and the sea through the gorgeous Crimean landscape. Because of the coastal location, it was only fitting to incorporate this style into the invitation suite. Swirls of blue, purple and white colors combine for a watercolor design that is as lovely as it is appropriate. The bride chooses a sleek updo and floral headpiece to accompany a gorgeous pale blue gown that honors her unique sense of style. The groom dons a simple light gray jacket and dark pants for his wedding day attire. Guests descend upon the outdoor ceremony with the sea and cliffs serving as an awe-inspiring backdrop to the nuptials. The bride clutches a colorful bouquet as she walks down the aisle to the awaiting groom. Underneath an asymmetrical arbor fashioned with fabric and flowers, the two exchanged rings and became husband and wife. After the ceremony, the couple and their small group of loved ones enjoy a buffet reception under the shade of the nearby juniper trees. Purple and lavender outfit many of the reception details including purple glassware, lavender macarons, and purple floral centerpieces. After celebrating, the new Mr. and Mrs. enjoy a romantic stroll on the beach below. With her husband by her side, the bride literally lets her hair down to witness the sun dipping below the horizon into the sea. Zhenya and Taras chose an inspiring setting for their Crimean wedding. And they used the location to influence the design of their special day. Every detail and accent – including the bride’s look – celebrated the beauty of the sun and sea, and of course, their special relationship. From the photographer: Our favorite time of year is spring. In the Crimea-this is the best time for weddings, when it is not very hot, and the grass is already beautiful deep green color, yet there are no tourists, and you can choose any location for your ceremony. Our today's shooting took place among green meadows, flowering trees and with a magnificent view of the mountains and the gorge Kachi-kalona. Just look at the colors of spring nature, the amazing colors of sunset! Gentle gathering of the bride under the spreading branches of cherry blossoms, away ceremony in the Crimea overlooking the mountains, where two lovers can say the most touching words to each other, and a cozy dinner with friends, among the beauty of the Crimean landscapes — what could be better!